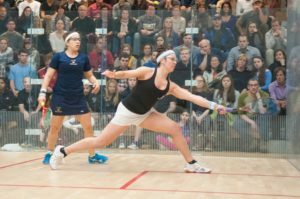 t’s a Sunday in the middle of the spring semester finals period, and Harvard senior Amanda Sobhy is competing at the World Squash Doubles Championships. Calling in from Chicago, Sobhy says that she is finding time to study but that it is difficult to provide full attention to reading notes when you are just an hour away from an international title in mixed doubles. At least her teachers have been flexible. The top-ranked women’s player from the United States was scheduled to take an exam the previous Thursday, but her professor decided to grant her some leeway. Thus, when Sobhy returned from Illinois clutching a second-place finish along with a carry-on bag, she had to face one last opponent: finals. If the life of Amanda Sobhy appears to be hectic, that is because it is. For the past four years, Sobhy has shouldered a heavy load of personal responsibilities, from professional tournaments and collegiate competition to a Harvard course load. But with a packed schedule has come impressive results. Over her four years with the Harvard team, Sobhy has never lost a match. In fact, she has dropped only two games while competing for the Crimson—both to Trinity’s Kanzy El-Defrawy—but she won both of those matches in four games. During this run, Sobhy has claimed four consecutive Ramsay Cups as the women’s individual national collegiate champion. Only Gail Ramsay, the award’s namesake and current coach of the Princeton women’s team, has also accomplished this feat. 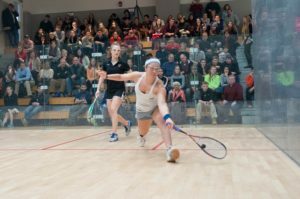 All this collegiate success has paved the way for Sobhy’s post-graduation plans, as she will play squash full-time after Harvard. For Sobhy, however, the idea of going pro is more of a formality than a significant milestone. Already ranked No. 10 in the world and No. 1 in the United States, Sobhy has multiple professional tournaments titles to her name, including one at the Women’s Texas Open in April. But over the years, while Sobhy has continued to rise in the national rankings, one thing has remained the same. At each step of her career, Sobhy’s father Khaled has cheered on his daughter. In fact, he served as Sobhy’s first coach and taught her how to handle a racket. A squash player himself, Khaled Sobhy met his wife, Jodie Larson, on a court in New York City. Their marriage produced three college squash athletes: Amanda’s older brother Omar, her younger sister Sabrina, and Amanda herself. Amanda developed an interest in the sport after watching her father train with Omar. Early in her career, the opportunity to beat her older brother pushed the middle Sobhy sibling through tough training sessions. These days, the more significant rivalry within the Sobhy family is the one between Amanda and Sabrina, the latter of whom is currently ranked fourth in the nation. In fact, a recent Boston Globe profile called the duo the “Venus and Serena Williams” of the squash world. In the finals of the 2014 U.S. 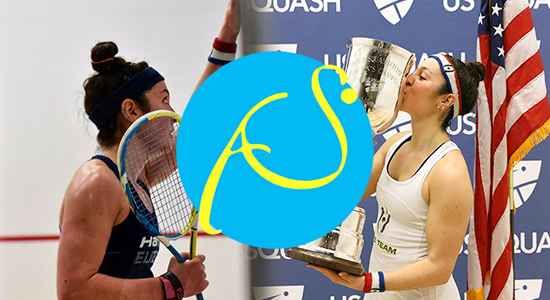 Squash Championships, Amanda matched up against Sabrina for the American crown. Youth triumphed over experience, as Sabrina took the match in three games. It was an internal struggle for Amanda: the uneasy balance between familial pride and personal disappointment. But the elder sister handled the defeat as she handles many setbacks, namely by turning them into motivational anecdotes. This past March, Amanda returned to that same tournament and claimed the U.S. national title without dropping a game. The dominant performance was reminiscent of the ones Sobhy has been putting on since the start of her Harvard career. Sobhy has held the Crimson’s top position since midway through her freshman season, a campaign in which she recorded a perfect 15-0 individual record. In that year, Harvard began the season as the top-ranked team in the nation and finished as the unbeaten national champion. Following up such an unblemished campaign is no easy task, and Sobhy admits to having battled feelings of pressure throughout her college career. At times, it was no longer enough to win every match—she also had to claim every game. Although Sobhy finally dropped her first game midway through her sophomore year, the small disappointment had no effect on her progress, as she still finished the season, and eventually her collegiate career, with a perfect record. Sobhy will face greater challenges in her post-collegiate career, which she will base out of Boston. Under a new coach, former No. 1 men’s player Thierry Lincou, Sobhy will train twice a day, six days a week and zip around the world for one or two tournaments each month. It’s a hectic schedule, but the Sea Cliff, N.Y., native has heard that before.